City of Commerce officials agreed on Tuesday to hold a series of workshops to explore ways to maintain the city’s focus on businesses and industry, while also protecting the health of its more than 12,000 residents. 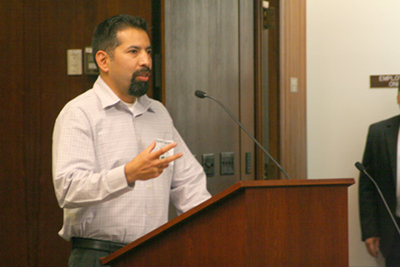 The city council approved a recommendation from the city’s Environmental Justice Advisory Task Force calling for a group comprised of members of the public, government officials, and researchers to come together this fall to look at establishing a “green zones” policy. Task Force Chairman Angelo Logan told Commerce officials on Tuesday that representatives of the U.S. EPA have offered to help facilitate the discussions so that the “burden of the working group is not on” city staff. The group will discuss strategies to attract green businesses and jobs to the city, as well as using land use planning methods to ensure areas where families and children frequent are protected from industrial pollution. 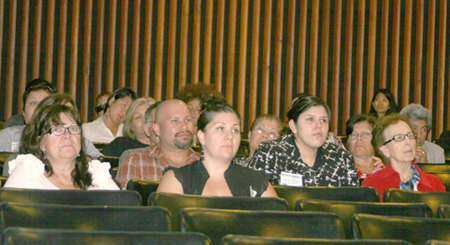 Residents and members of a local environmental justice group came out to support the green zones working group. “I’ve been here 45 years, and the air really doesn’t seem to get any better…. I’m supporting the green zone,” said Sonny Roque. Assemblyman Ricardo Lara (D-Bell Gardens) also submitted a letter of support. “The disproportionate amount of pollution put low income minority families at greater risk for various health complications. Commerce residents need a sustainable solution to reduce their exposure to pollution from railyards, freeways, and other industrial land uses,” he wrote in a letter to the city. The specifics of the green zones policy have not yet been “fleshed out,” Logan said on Tuesday. He asked that the city keep the workshops informal by not requiring a quorum, and urged officials to set a milestone to have a green zone policy drawn up by a set time. “We need to move expeditiously… so that we’re not late in the game, and the last city to adopt a green zone policy. We want to attract those businesses first so that we can gain those revenues and resources and create those jobs for our residents,” said Logan. Similar efforts to create “green zones” were initiated in the City of Los Angeles in the Boyle Heights and Pacoima neighborhoods earlier this year. Logan sits on the city’s Environmental Justice Advisory Task Force, together with residents, city officials, and members of the business community. Last year the task force voted to recommend buffer zones to prevent environmentally harmful industries from locating near places like daycare centers, schools, churches and homes. The buffer zone proposal was based on collaborations with research institutions like the University of Southern California, and on recommendations in the California Air Resources Board’s Air Quality and Land Use Handbook. The business community, including the Commerce Industrial Council Chamber of Commerce, and several union groups have been approached about the green zone idea, according to Logan. Instead of looking at a green zones policy as a way of limiting the kind of businesses that could come into the city, she says this policy could mean actively attracting businesses to the city. “Everyone knows there are problems with the economy… we need to balance the budget, get out of the red, so it makes sense to bring in businesses that will help us do that… by seeking out green businesses,” Del Rio said. On Tuesday the city council tossed around a potential start date of August for the workshops, and plan on coming back in four to six weeks for an update. Representatives of the planning commission, and the Commerce Industrial Council, are expected to be part of the working group. Green economy experts and academic researchers have also been lined up to take part. June 23, 2011 Copyright © 2012 Eastern Group Publications, Inc.